Today, the Plain Dealer reported on an updated look at Ohio charter school performance from the Center for Research on Educational Outcomes (CREDO). The center, which is housed at the free market Hoover Institute at Stanford University, discovered that Ohio charter schools are performing about as poorly as ever. "There is little to no progress in Ohio charter school performance," concluded CREDO Director Macke Raymond, whose comments several years ago about how the free market system hadn't worked in education caused quite a stir. However, like most charter school analyses ever done in Ohio, CREDO did find pockets of success among brick-and-mortar charters, and blamed the overall stagnant performance on e-schools. Leave it to Aaron Churchill of the Fordham Institute to drive a truck through that mouse hole. "After years of shortchanging charter students, lawmakers should finally move to fund brick-and-mortar charters equitably, helping to kick-start new-school formation and the rapid expansion of the state’s top-performing charters,” Churchill wrote. Obviously trying to piggyback on his dubious claim that charters don't get enough money and have earned a raise from state lawmakers, Churchill really stretches out over his skis here. There are major caveats with CREDO's methodology (for a detailed breakdown, take a read here), but here is my major concern -- the group only looks at student growth. That is one of MANY measures of a school's performance. And growth has always been an area where charters and districts perform more similarly. Districts still beat charters pretty well on the measure, but it's not quite the runaway contest that proficiency or graduation rates are, for example. 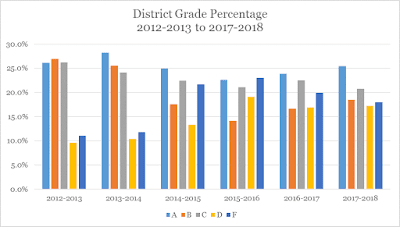 Here's another thing: Ohio's been artificially deflating school district performance for years now, dragging down their overall grades to better comport with historic charter school performance. Don't believe me? Take a look at the percentage of grades each sector has received each year since the state started using the A-F system in the 2012-2013 school year. What you can see is that since Ohio started changing its testing regime, and more heavily weighting the more charter-friendly "value added" measure, low district grades have skyrocketed. 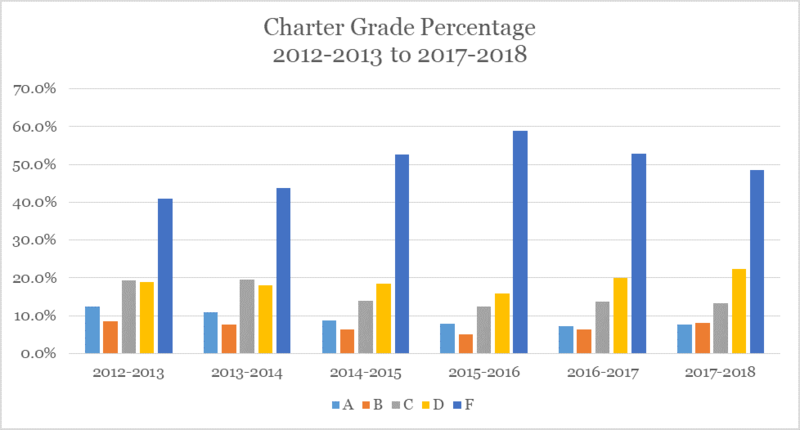 Meanwhile, charter grades have pretty well stayed the same during the same period -- overall pretty bad. Importantly, though, Districts still have less than half the rate of F grades as charters. Just saying. This got me thinking about the whole light speed thing again. According to Einstein's Theory of Relativity, it is impossible to go faster than the speed of light (though as a sci-fi fan, I sure hope it's not) because it requires infinite energy. So you can approach light speed, but never go over it. How does this apply to state report card grades? Well, it's like this: Charter performance was so bad, it would have been impossible for them to get much worse. So they had nowhere to go but up, really. 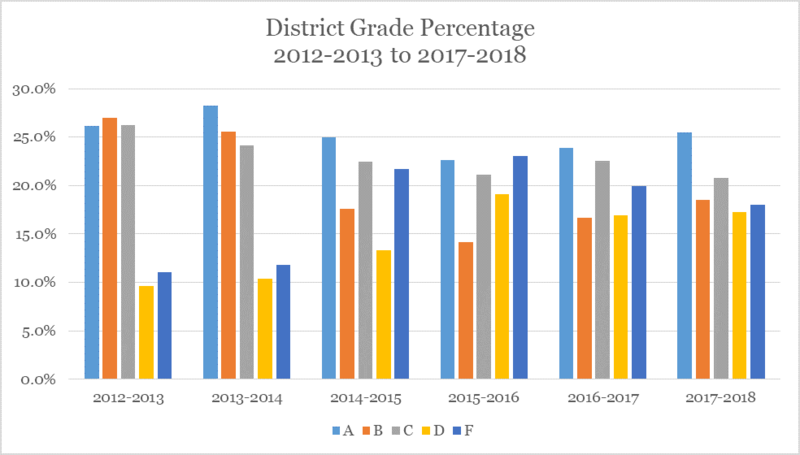 Meanwhile, school district performance was flying quite high in 2012-2013, with barely 10 percent of district grades being designated Fs. So when the state starts implementing new tests over a short period, districts have a farther way to fall, which they do (by design, I might add), which makes it seem like maybe charters are gaining on districts, when in fact district performance is simply being artificially dropped not by actual performance, but by state policy changes. Does anyone actually believe that districts are twice as likely to have failing grades today as they were 5 years ago? Please. 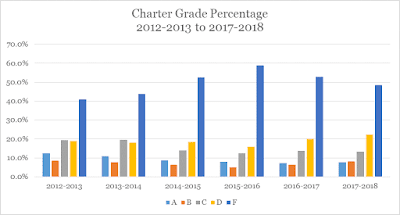 What is amazing is that charter school performance has remained remarkably consistent. And poor. Yes, their Fs and Ds jumped a bit after all the testing changes. But really, they've been at about 50 percent Fs all along. Is this because charters did a better job at handling the changes? No. It's because they were approaching light speed already, and they couldn't have done much worse overall. So even though Churchill and others claim that charters have demonstrated their worth and earned the right for a pay raise from the state, I contend if you think they should get a pay raise now, why shouldn't it have come in the 2012-2013 school year when only 40 percent rather than 50 percent of their grades were Fs? Why would we reward their worse performance today? Yes, it is true they've improved since the low point of 2015-2016 (the last of the three consecutive years of test switching). But they still receive a higher rate of failing grades than they did in 2012-2013 and have only seen a 17 percent drop in frequency of Fs. Districts have cut their F frequency by 22 percent. Want another staggering data point? Since the 2012-2013 school year, a total of 11,832 grades were handed out to the state's charter schools (only 7 schools were statewide e-schools for this whole period, by the way, so the vast majority of these grades are for brick-and-mortar schools). Of those 11,832 grades, more than half were Fs. That means since 2012-2013, charter schools have received more Fs than all other grades combined. The number of As? Barely 1,000. Out of nearly 12,000. What grade have districts received more than any other? And this is despite the fact that districts' performance has been intentionally Nerfed by state policymakers who desperately want charter schools to succeed even though the evidence is pretty overwhelming they aren't overall. Can charter schools work here? I believe they can on a limited basis. Are there pockets of success?Yes. Of course. But for advocates like Fordham to contend an overall performance revolution in Ohio charter schools as the basis for an overall pay raise for this long-struggling sector that even charter advocates admit aren't improving a whole lot, stretches the bounds of reason, especially given how much the state has divested from the 90 percent of kids who aren't in charters. Let's fund charters based on what it actually costs to educate kids there. Let's give performance bonuses where warranted. Let's do it without hurting kids who aren't in charters. The whole system of rating schools in Ohio is a scam.